Maybe you met it, with its feline suppleness ad amber eyes… Hidden right in the heart of Cognac, we guess it behind the impressive door of the house, we catch a glimpse of it in the paradise. The panther made its mark on Cognac Meukow. COGNAC MEUKOW is one of the last family and independent companies of the field. Its story begins in the 19th century when two brothers native of Silesia are appointed by the Tzar of Russia to supply the court with Cognac. They eventually install their commercial office in Cognac in 1862, A.C. Meukow and Co was born. Entered in Compagnie de Guyenne’s portfolio in 1979, the tradition Meukow continues thanks to the Coste family today. Philippe took over the chairmanship of the Company, his brother-in-law, Claude Brugerolle, the vice-chairmanship. His sisters Céline and Marie-Laure assist him in the marketing and the administration. But to discover – or to catch a glimpse of – the secrets of the house, you will have to visit the panther’s den, the Paradise. There are stored barrels containing the fruit of the work of fifty years ago. The cognac will rest there maybe another ten years, not more. 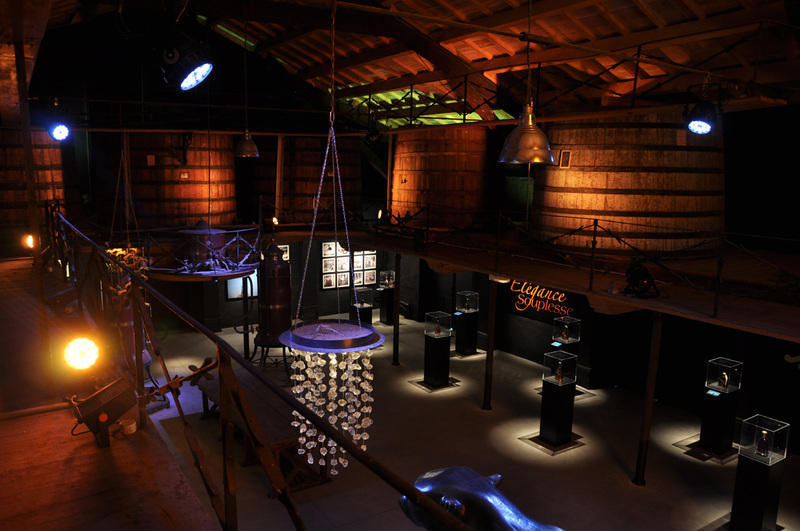 The place livens up a few minutes with a magnificent scenography inaugurated in July, 2012, presenting the work of the cognac as the seasons go by, from the vine to the barrel. The half-light comes back, the panther jumps and leads you along the 19th century turns towards the oenologist’s laboratory. Here the demi-johns are aligned, testifying of the history of Meukow cognacs since its beginnings. A	moving place where are also exhibited mouth-blown bottles, of a time in which the inventor Claude Bouchet had not yet invented his machine; they carry the irregular imprint of manual manufacturing. Today the carafes bear the famous panther. This symbol was chosen in 1995 to embody the strength, the elegance, the suppleness of Meukow Cognac. Initially drawn for the Asian market, the feline became the emblem of the brand. But as a reminder of its origins, every bottle also displays the first logo of the house, “the flowery hand”. His cognac finds its qualities and its elegance in Ugni Blanc essentially, ideal as it has a low alcohol content but high acidity. The house favors the crus of Grande and Petite Champagne and some Fins Bois. The VSOP Superior (the youngest brandy into the blend is 5 years old) with an average 12 years old, has a beautiful amber hue, a round, smooth, liquorice-scented palate. Many times awarded, it is THE reference Meukow. The XO, with its beautiful copper color, exudes scents of chocolate, caramel, brown sugar, and also offers a beautiful roundness in the mouth. To attract a more feminine clientele and ride the wave of mixology, the house launched Meukow Vanilla, mesmerizing marriage of cognac and natural extracts of vanilla, and more recently a liqueur of coffee with cognac. 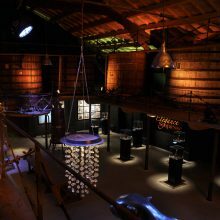 Besides the creation of the circuit, the house turned an old neighbouring mirror factory into an immense room with a visible frame, similar to a boat hull, a cathedral bathed with light. This space, Salle Guyenne, was created to welcome receptions, exhibitions, and also shelter the new offices. To receive the members of their Club, but also for the visitors who wish to taste some more of the magic of the place, the family opened the culinary studio Chai Meukow where Chef Sabine Lambert cooks with fresh products directly delivered by local wholesalers. Cognac Meukow is present in 76 countries, on the great tables, in wine shops but also in large retailers like Nicolas.